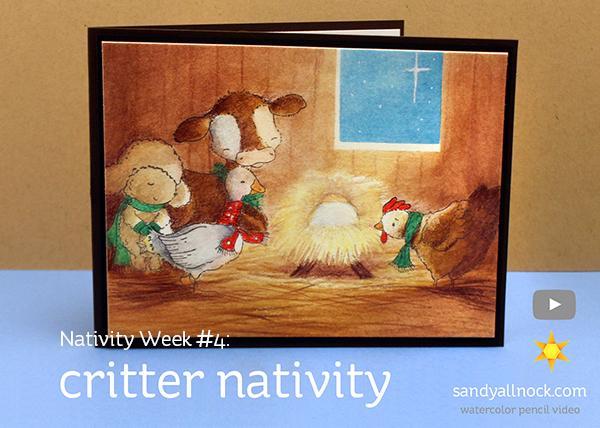 And now for something yet a bit different – another nativity, but this time attended by critters only! 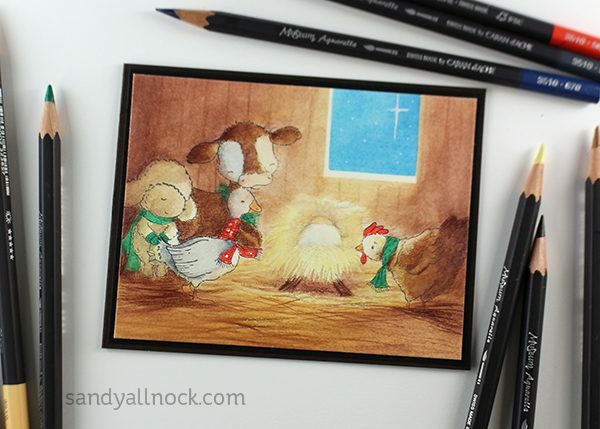 I decided since I had some of the new Purple Onion stamps from their recent release that are facing into the card – drawing a little manger between them would be perfect! But the art supplies I grabbed along the way gave me a little surprise….but it kinda worked anyway. Enjoy the speed coloring – and my silly chatter! Watch the video below or click HERE to see it in HD on YouTube. 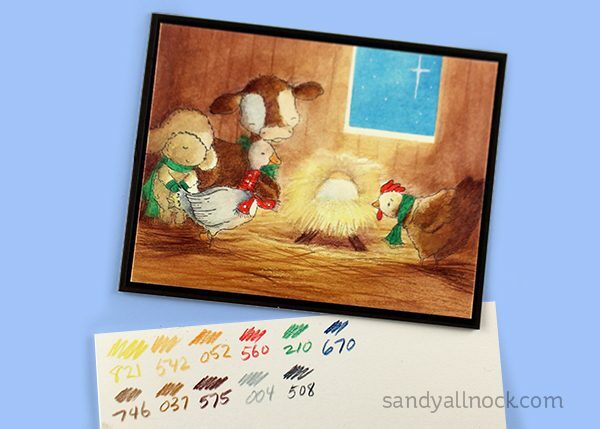 These are the colors used on this card, from the Caran d’Ache line of Museum Aquarelle watercolor pencils. Purple Onion is having their yearly sale – so you just might want to check it out HERE! 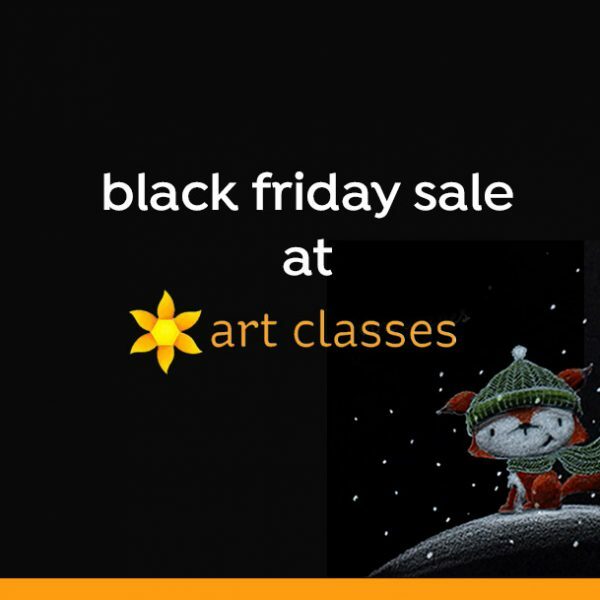 Hop over for a sale on classes – no coupon necessary! Also, for anyone buying a class today – I have 12 flat rate envelopes filled with stamps and dies to send out to random students, so if you’ve been waiting to sign up for a class, today’s the best day! Baby Wipes: I just use the Costco brand! Sandy,what an absolutely wonderful idea – I love the whole card, but the idea with the baby wipe is a fantastic technique I HAVE to try – thank you so much for sharing!!! It is so beautiful Sandy, I love this and the way you made it. Almost wiht my moulth open en my nose to the screen I looked how you coloured, babywiped (if that is a word) coloured again, more babywipe and than as finishing touch again some pencilstrokes and the resuld is stunning. Thanks you so much for showing this experiment, it was great. Such a beautiful scene! Looks like something that should be gracing the covers of a favorite children’s book. LOVE it! How precious. I absolutely love this card and enjoyed watching it develop. I have a quick question if you don’t mind… I shy away from watercolors (they intimidate the heck out of me and rarely turn out anywhere near what I want or intend them to.) I would love to try a watercolor background for some Copic colored images. Is there a paper that is suitable to use a combination of Copics and watercolors on together? Thank you. Not that I’ve found. The mediums interact to paper in completely opposite ways. Oh my goodness Sandy this is AMAZING! Thank you SO much for sharing this. The closest thing I have to “real” artist grade pencils is a random selection of Derwent w/c pencils, that I bought over 15 years ago when my daughter was in art school. Otherwise, I am using the left over Prismacolors that she and her brother had from elementary… LOL I have used the w/c’s but this gives me something new to play around with and try. Adorable card. Thank you so much for sharing your “mistakes” with us. Your honesty is refreshing. Sweet nativity scene! I love the animals, and your coloring is always fabulous! Love the critters around the manger. Very cool. I did that 2 yrs ago on a Christmas card, and it’s still sitting in a shoebox, waiting for me to decide what on earth to do with it! Now I know I can use a baby wipe and (hopefully) end up with a nice card! It’s not on the Stonehenge paper or museum quality pencils, but at least I can try. Got nothing to lose if it doesn’t work, and trying something new is good for the soul! Your card is just precious – thank you for sharing your experience. What a sweet scene- love the card. Why can’t my boo-boos turn out this good?! ?